Australia is considering buying top-secret technology from Japan to build a fleet of next-generation submarines, a move that would risk reigniting diplomatic tensions with China that have only recently died down. China and Japan are competing to build up their domestic arms industries, and for China, the export of Japanese military technology is particularly sensitive given their wartime history and territorial disputes. 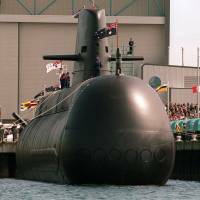 Choosing Japan to play a role in the multibillion-dollar submarine project could prompt a stern response from Australia’s biggest trading partner. Australian Defence Minister David Johnston has confirmed “unsolicited proposals” to build the submarines had been received from Japan, Germany, Sweden and France, with a decision on replacing the country’s aging diesel-powered submarines expected by March. Alongside Australia, countries such as Vietnam and India are expanding their submarine fleets as China seeks greater military clout in the Pacific. Australia needs to replace its six Collins-class diesel electric subs by 2026, according to Johnston, who is looking for a cheaper option after scrapping the previous Labor government’s plan to build 12 submarines locally, which Thomson estimated would cost around 36 billion Australian dollars (¥3.5 trillion). He has not ruled out any options on where the craft, designed to help Australia patrol the Pacific and Indian oceans, will be built. Choosing Japan would be a bet that its technology will be workable and risks angering Australian voters who want the project kept onshore. Japan itself is struggling with how much to shed its pacifist mantra, though Prime Minister Shinzo Abe has increased the defense budget. Prime Minister Tony Abbott is seeking to balance Australia’s economic ties with China with its military partnerships with the U.S. and Japan. Australia in 2011 agreed to host as many as 2,500 marines in the northern city of Darwin as part of U.S. efforts to preserve its military influence in the Pacific at a time when China is calling for a new model of great power relations. Australian Air Force bases have been selected by the U.S. Department of Defense to host maintenance work for F-35 Joint Strike Fighters operating in the Asia-Pacific, Johnston announced Wednesday. The Australian government this year ordered 58 of the Lockheed Martin Corp.-made jets for nearly $1.2 trillion on top of the 14 it pledged to buy in 2009. It’s not necessary for Australia to have “so many” new submarines, said Shi Yongming, a research fellow at the China Institute of International Studies in Beijing. Japan has been deploying Soryu submarines since 2009, with the latest models costing about ¥60 billion, Yasushi Kojima, a lieutenant commander at the Maritime Staff Office, said by phone. Compared with the previous Oyashio submarines they can stay under longer, have stronger motion performance and are better able to avoid detection, he said. Japan has a reputation for producing high-quality goods on time and on budget, though it has not exported submarines before. That makes it hard to compare their submarines with those made by countries like Germany, said Cheng. Abe’s government this year eased arms exports restrictions that had been imposed in keeping with the pacifist Constitution. “We’ve had the Japanese experts come out here, look at what Australia is doing and take our good ideas home,” he said. The Australia Defence Association, a nonpartisan security group, said the Japanese technology is not as viable for Australia’s purposes as some may think. ThyssenKrupp AG, Germany’s largest steel maker, said its marine unit could build 12 subs for Australia for about $16.3 billion. While Germany has experience in producing submarines for export, it has not built one to the size Australia requires, James said. 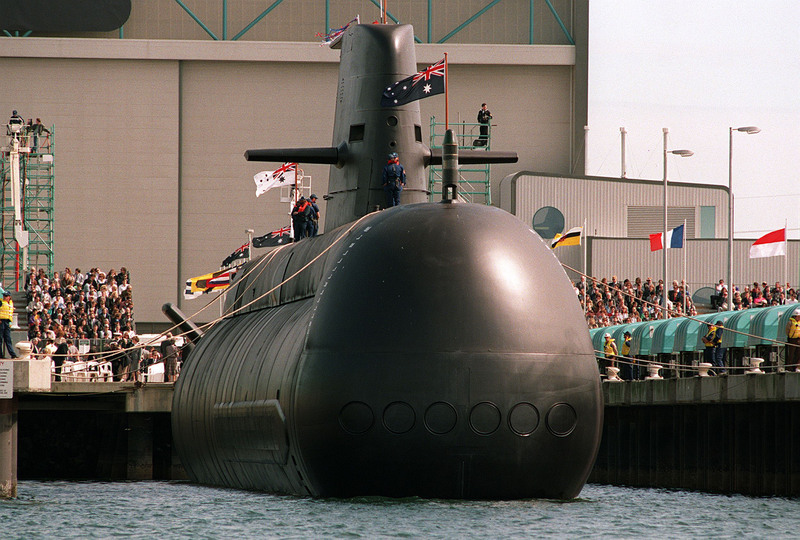 Abbott may opt for a “hybrid” solution — have the hull and propulsion systems built offshore and assemble the submarines in Australia with the U.S.-supplied combat and weapons system, Thomson said. A domestic build would be a more politically acceptable option for Abbott, whose government is lagging in opinion polls. In the three months through September the economy grew at the slowest pace since the first quarter of 2013, while the jobless rate stands at 6.6 percent in South Australia, the state that is home to the government’s defense contractor ASC. “With manufacturing jobs disappearing, Abbott can’t be seen walking away from the defense industry,” said Haydon Manning, a politics professor at Flinders University in Adelaide. There is a lot at stake for Australia to get its decision right, according to Cheng of the Heritage Foundation.